Quite a lot of people know how particular I am about most things, especially books so I thought doing a Bookcase Showcase was the perfect opportunity to show everyone what my books look like! After moving home from university for the summer, I had a lot of books to sort out into their rightful places and even though I thought it might take me a while, it ended up taking a lot longer. Three whole hours were spent organising books into piles and moving things around so that they would all fit somewhere. Running along one whole wall of my bedroom are two rows of shelves. Not many people know that I do read a lot that isn’t YA because I don’t review it and now, I don’t have so much for it anymore but on these shelves are mostly any books that aren’t YA. This is the top shelf which mainly consists of historical romance. 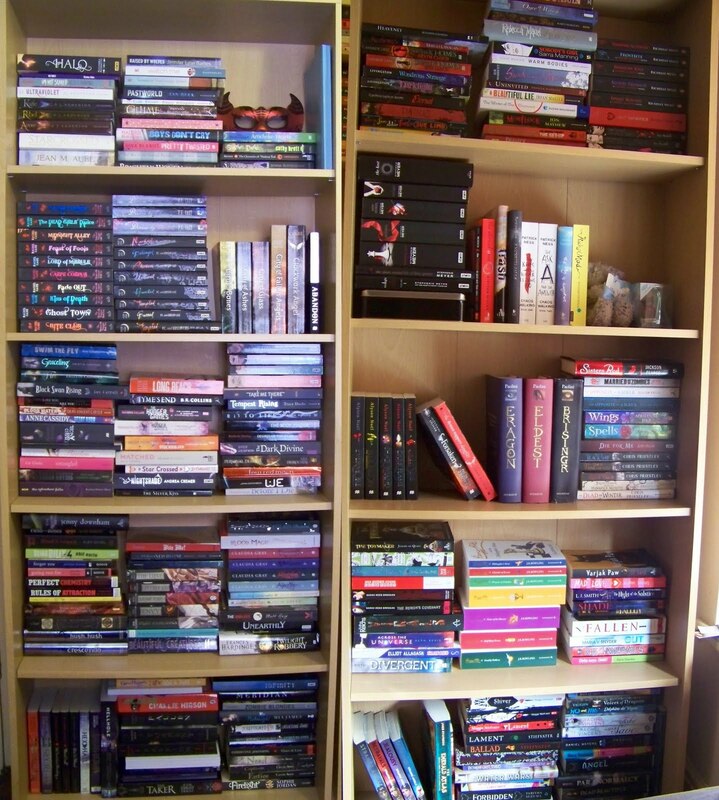 As you can see, I have quite a collection from certain authors and near enough everything that have published in the UK. Stephanie Laurens is probably my favourite and she has the most books out over here compared to the likes of Gaelen Foley and Julia Quinn. On this shelf is also chick lit and a couple of other random books that don’t fit anywhere else. Right at the end (although not pictured because they wouldn’t fit in) are some huge books like Jemma Kidd’s Make-Up Masterclass and The Costume History. Below is the bottom shelf. To begin with there are historical books moving into classics and anything I have read at uni. It REALLY bugs me that I haven’t got more of these with the same covers. I really like the Vintage covers (books with the red spines) so eventually, I’ll replace as many of them as I can so that they match. Towards the end of this shelf are poetry books, fairy tales (this is what I’m writing my dissertation on) and text books. Along with my adorable heated monkey, Eric, are my a chunk of my books for next year at uni. I haven’t even attempted to read any of these yet though! I don’t put any YA books on a shelf that haven’t already been read normally. There are a few exceptions for ones that I probably wont read but there are hardly any at all. All of my YA books are organised into alphabetical order by author surname and it takes a hell of a long time to add in new books sometimes due to lack of space now. 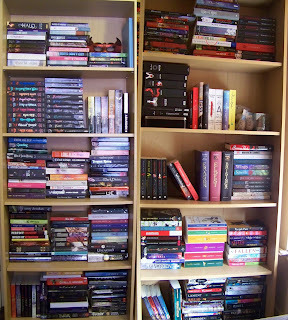 When I first started blogging, I only had one bookcase and no shelves but now, I have had to split YA into two different cases and I’m quickly running out of space. Lastly, this is my TBR pile. This is in no order whatsoever because honestly, I just shoved them on there so they weren’t on the floor. The size and width of the pile is scaring me a little bit now and I’m worried it’s going to topple over soon. Luckily, having all summer off uni I can make a good dent in that and hopefully get through a decent amount of books. Now that I have taken pictures, I have realised that the long shelves along the wall definitely need reorganising into a proper order because now, all I can see is that they’re wrong. I am not a complete control freak after all!! I finally don't feel bad about my TBR pile! LOL. wow Lyndsey! you are a proper neat freak! (In the nicest way possible!) You will totally get on with my sister, one of her favourite authors is Stephine Laurens and she'd love most the stuff on your non-YA shelves! I love the Vintage classics series too - I'm in the process of collecting them! I've considered organising my books by genre too, but I've always done it alphabetically so it's (pathetically) a huge leap for me! Maybe by genre and then by author... Anyway, your shelves look wonderful so it's inspired me a little! Holy TBR pile! Beautiful shelves!